WHO: A “Must” for 1st time applicants for the event. A runner-participant must have finished a Marathon Race with at least 6 hours or better as finish time. BDM 102 “veterans” are not required to attend the lectures. However, they are encouraged to join the “test runs”. WHEN: Every 1st & 3rd Friday of the month. From 6:00 PM-7:30 PM. The first clinic/lecture will be held on Friday, October 1, 2010. The lecture will start at exactly 6:00 PM. Two weeks before this story was published at the Philippine Daily Inquirer’s (PDI) Sunday Inquirer Magazine, I received an SMS from Eric Caruncho introducing himself as a writer for PDI asking me for an interview in relation with his assigned job to come up with a story on extreme sports. He specifically mentioned about the Bataan Death March 102K Ultramarathon Race. I told him that I don’t want “e-mail interviews” as I prefer to have a “face-to-face” interview with him and other journalists. I could be the conservative type on matters like this but I know that this is the proper way for a writer to actually feel and get a full knowledge about the topic from his source. I would like again to experience those “eye-to-eye” contact while talking to a journalist as I have experienced when I was still in the active military service. I asked Mr Eric Caruncho to send me “guide questions” through e-mail so that I could prepare for our meeting/interview. I was glad he sent me a list of questions immediately and we set for a meeting a few days after. So, the meeting was set and Eric arrived ahead of schedule but I was there already at our meeting place before he arrived. I was happy to see him carrying a tape recorder, writing pad, and a ball pen. Great! I have the impression that I am dealing with a real and professional journalist. Over a cup of coffee and a simple Filipino breakfast in one of the Military Golf Courses in Manila, the following story was the result of our meeting-interview. Thanks, Eric for the nice story! I hope you will regain your love for running with his story. THERE are marathons. There are ultra-marathons. And then, there’s the Bataan Death March. Quickly gaining a reputation as the toughest race in the Philippines, the aptly-named Bataan Death March (BDM) is an annual 102-kilometer slog that retraces the route of the infamous World War II debacle from Ground Zero in Mariveles, Bataan to San Fernando, Pampanga. Now on its third year, BDM promises to be an even greater challenge for “the few, the proud, the brave” next year. The race organizers plan to extend it to 151 kilometers, retracing the final journey of the original survivors of the death march to the Japanese concentration camp in Camp O’Donnell in Capas, Tarlac. If you have to ask “why,” you’re obviously not ready. But if your question is “why not,” then perhaps you have the makings of an ultra-runner, for whom the full marathon distance of 42 kilometers is just the starting point. 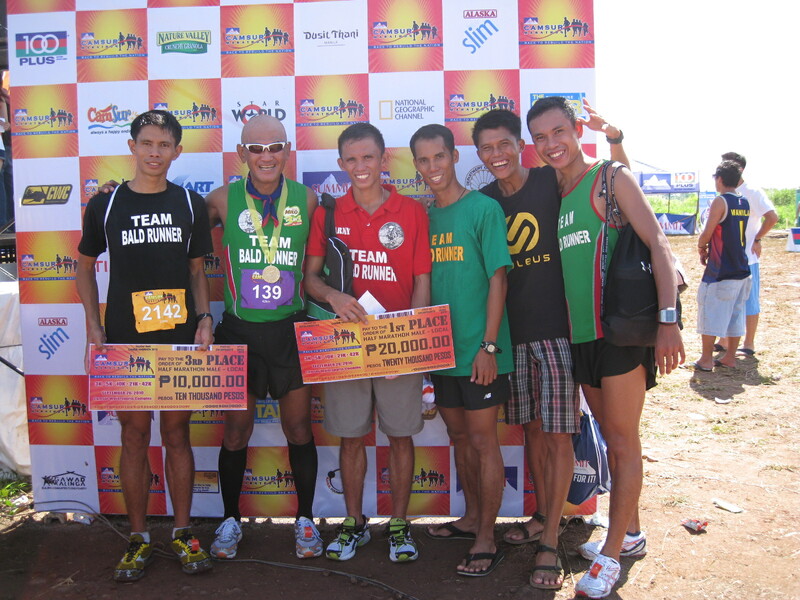 The Bataan Death March is the brainchild of retired Major General Jovenal D. Narcise, better known to the local running community as the Bald Runner through his blog “Bald Runner” (www.baldrunner.com). “We wanted a nice gesture to remember our Filipino heroes,” says Narcise, who at 58 has a blood pressure of 110/70, a resting pulse rate of 50 to 60 beats per minute, and the same 29-inch waistline he had when he was a cadet at the Philippine Military Academy – all thanks to his high-mileage, clean living lifestyle. 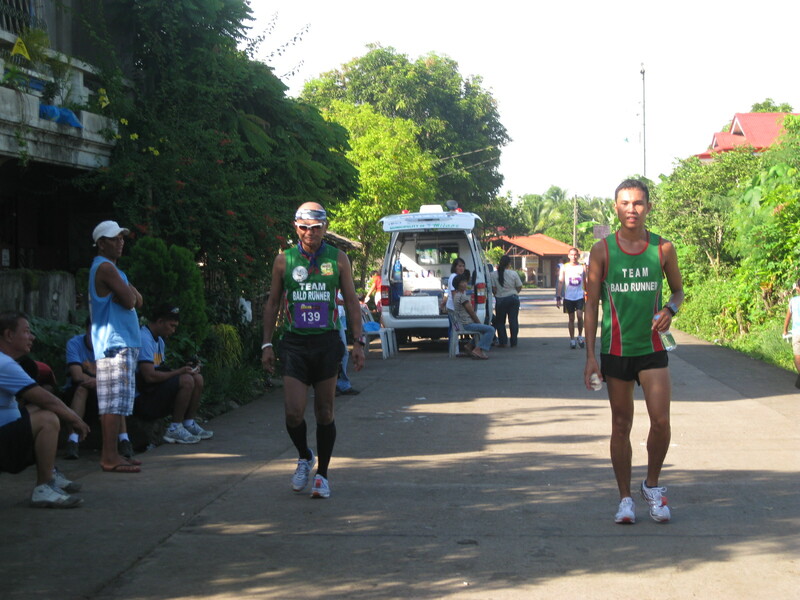 Back home, local runners had been competing in the Araw ng Kagitingan ultramarathon relay on the anniversary of the Fall of Bataan. Under the International Association of Ultra Runners, the federation that regulates ultramarathon events, the standard ultramarathon distances are 50 kilometers, 100 kilometers and 100 miles. 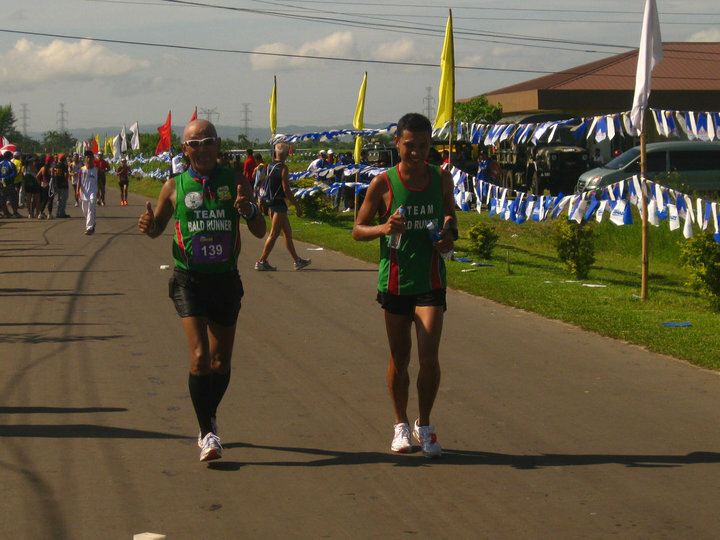 Narcise had had a bit of experience organizing races as an army commander, when he was in charge of the AFP’s Gintong Pangarap marathon. With his own funds (taken out of his retirement benefits), Narcise organized the first Bataan Death March in 2009. To avoid the hottest part of the day, the race started before midnight. Out of 85 runners, 82 managed to make it to the finish line, with the fastest runner finishing in a little over 9 hours. The second BDM held last April had even more participants, with 120 finishers, including 13 international competitors from the US, Singapore, Japan and France – all of whom heard about the BDM and signed up for it through Narcise’s blog. Despite the absence of any corporate sponsorship, the BDM is shaping up to be one of the premier annual events on local runners’ calendars. Narcise isn’t just dreaming, however. 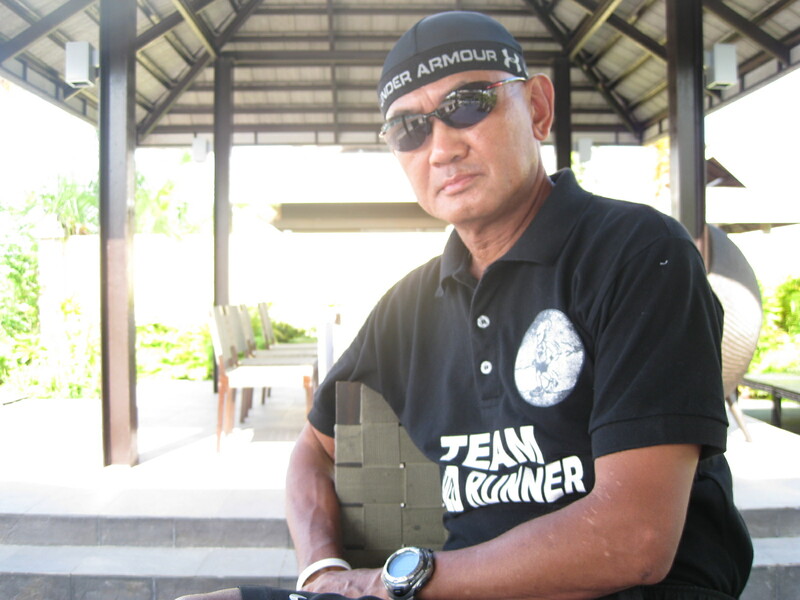 He has organized local endurance athletes into the Philippine Association of Ultra Runners (PAU), which is federated with the International Association of Ultra Runners based in Morocco, a group that includes 40 member countries. Under its auspices, he has organized monthly ultramarathon events. He even sponsors his own Team Bald Runner, a core group of 15 elite athletes. Through his blog, Narcise has become a pied piper of sorts for local endurance athletes and enthusiasts alike, providing training advice, anecdotes from his own experiences, commentary on local races, and miscellaneous information on diet, nutrition and training. Originally from Laoag, Ilocos Norte, Narcise’s own running path started in 1968, when he was a pre-med student in Baguio dreaming of entering the Philippine Military Academy. The running seemed to help his constitution, and he continued to run as a cadet. His running was interrupted, however, when he was assigned to Mindanao as a fledgling army officer, right in the middle of the MNLF rebellion in the mid-1970s. By the time he returned to Manila three years later, the first running boom was in full swing. He paid particular attention to the work of Arthur Lydiard, the legendary New Zealand coach who basically wrote the book on training for long distance running. His career path took him through various commands in the military, but physical training became a constant in his life. Narcise ran his first full marathon in 1980, and from then, there was no looking back. He continued to run local and some international marathons until his retirement three years ago, when he discovered the wonderful world of blogging. 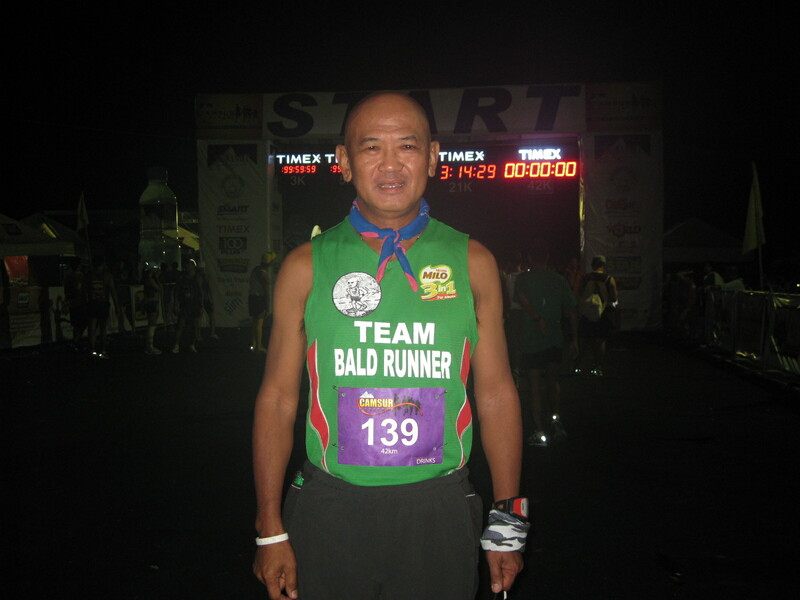 He started Bald Runner in 2007 as a way to share information and experiences about training. It has since become one of the more popular sites for local runners, especially on ultra distance events. “In an ultramarathon, you are trying to find your limits physically, mentally and psychologically,” he says. Obviously, a 100-kilometer run isn’t for everybody, but for those who are willing to put in the necessary training mileage, ultramarathons can often be easier than the marathon. In ultramarathons, it is also necessary to eat during the race to replenish the body’s nutrients, to hydrate, and to take walking breaks in between running. 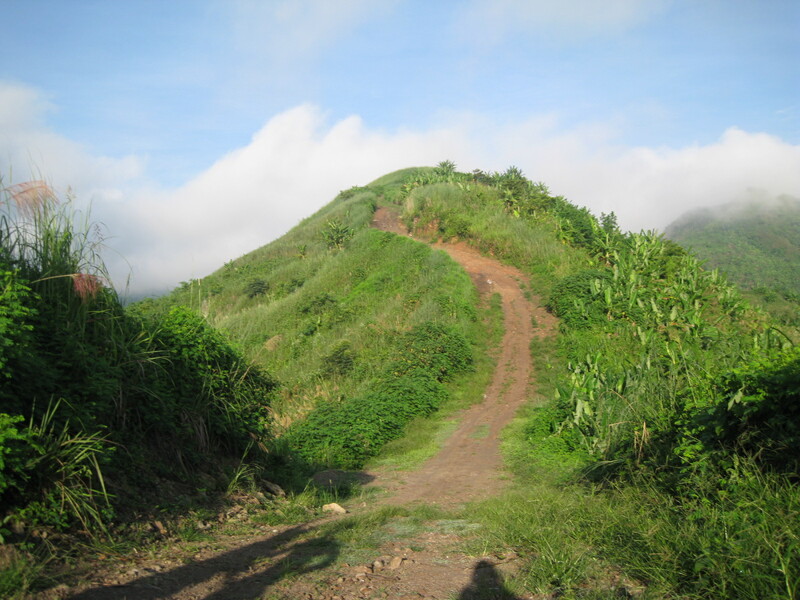 The Bataan Death March provides typical Filipino fare, including boiled bananas, boiled sweet potatoes, and a bowl of steaming mami or arroz caldo at the 50-kilometer mark, although many runners also bring carbohydrate gels, power bars and sports drinks. All of these make ultramarathons less of a grim and determined death race and more of a shared bonding experience. Be that as it may, Narcise says prospective ultramarathoners should build up their weekly mileage to at least 50 kilometers a week, slowly building up to 80 to 100 kilometers a week as they near the event. 1. This is my 3rd Marathon Race for the year and I prepared this race without any training plan or program. Everything was done by “feel” and “instinct”. All my runs after the 34th MILO Manila Marathon Elimination were easy long runs; mountain trail runs; and a limited once a week tempo runs. Basically, I did not train for “speed” on this marathon race. I concentrated more on my “back-to-back” weekend easy long runs and decided to have the CAMSUR Marathon Race as part of my easy long run in preparation for another “epic” running experience in the future. 2. I finished the race in 4:39:33 hours (unofficial) as recorded in my GF 305. It is not a “shabby” finish time but I was able to learn a lot of what my body is capable of with my age of 58. Comparing myself with my friend and BDM 102 “veteran” Victor Ting who is already 62 years old, he was faster in reaching the Finish Line and I think he was ahead of me by 3 kilometers, I think I still have the chance to reach his age and run as fast as he can. But I think Victor is getting faster as he grows older. But for now, speed will remain at the back burner up to the end of this year and I will slowly introduce it again in my workouts at the start of the new year. 3. So far, this Marathon Race is the third major running event in the country that is fully sponsored and supported by a local government unit. The City Government of Quezon City came first with its own version of an International Marathon Race on the later part of last year and it was followed by the Cebu City Marathon last January 10 of this year and now it’s the Provincial Government of Camarines Sur. These local government executives in these cities and province are commendable for promoting the sports of running with their own resources without the support of the national government. How I wish more of these kind of local executives should come up with such sports events in their respective provinces and cities in order to promote their place through sports tourism. With cash prizes at stake on these running events provided through the efforts of the local executives, it will give more incentives to our elite athletes to train some more and at the the same time inspire the local folks and “grassroots” to develop themselves as competitive runners in the future. My salute and congratulations to the good leadership of these “pioneers” in promoting international running events in their own cities and provinces. 4. 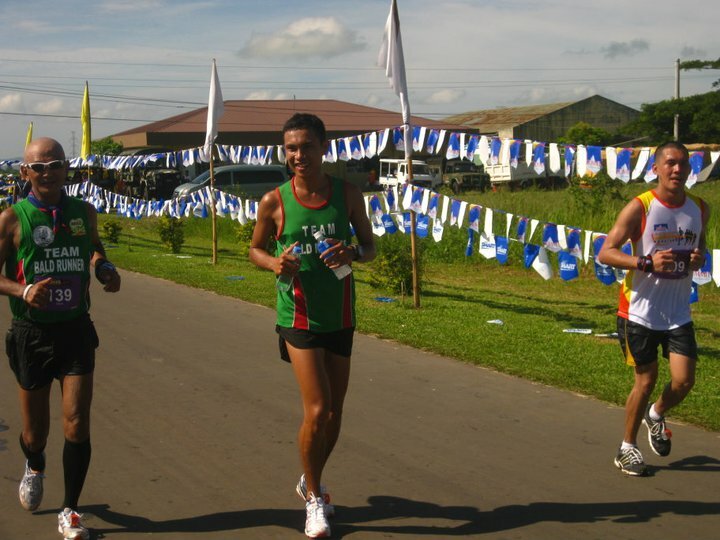 Camarines Sur Marathon is showing an example of the trend of marathon races in the country. It is no longer possible to have an ideal environment for a marathon race within the confines of Metro Manila and its immediate environs because of the problem of vehicular traffic, pollution, poor quality of air and the “no concern attitude” of the residents to people who are competing in a road race. It is only in the province and cities outside Metro Manila where you see spectators cheering and saying best wishes and good greetings to runners along the route of the race. Moreso, you can feel the hospitality when you see the barangay officials and folks manning the different Aid Stations offereing some food and water to the runners as Volunteers. I was informed that the Race Organizer had fielded almost 1,500 volunteers for this running event. 5. Going to Naga City and Ipil by land and air from Manila was so easy. By land on our own vehicle, it took us an easy 8-hour ride on the late evening from Manila and arriving at Naga City on daybreak. Travelling by bus, I heard it was more comfortable by sitting on “Lazy Boy” seats with a Comfort Room inside. And by plane, after a short 45-minute ride, you are already in Naga City. 6. Having registered to run the Marathon Race last June, I had a lot of time to plan for the trip and for the accommodation for my Elite Team. I was lucky to know that one of my officers assigned as one of the General Staff of my Command when I was the Division Commander in Panay Island is now assigned with the 9th Infantry Division of the Philippine Army based at Pili, Camarines Sur. Col Ace De Asis took upon himself to look for a place for us to stay. I was surprised to find out that another officer who served as my Camp Engineer in Panay Island is also assigned in the said place. Through the transient facilities of the Philippine Army, my team and I were “billeted” at the VIP Transient Facility of the 565th Engineer Battalion of the Philippine Army for almost 3 days. 7. We arrived in Pili, Camarines Sur on the early morning of Friday and went around the facilities of the CWC and later proceeded at Camp Martillana where our the Philippine Army’s Transient Facility is located. We were received by our host, Lt Col Tony Celoso ( my Command Engineer in Panay Island) and led us to their Battalion’s VIP Transient Facility. The facility has two big bedrooms with two bathrooms; a big living room with TV and cable connection; and dining area. We were able to buy fresh foods at the Pili Market and cooked them in the facility’s kitchen. My elite team’s members were the cooks, dishwashers, and the ones going to the market to choose what food to eat for the day. 8. My elite team and I attended the scheduled briefing on Saturday morning at the CWC and I was impressed on the preparations made to make this running event a success. 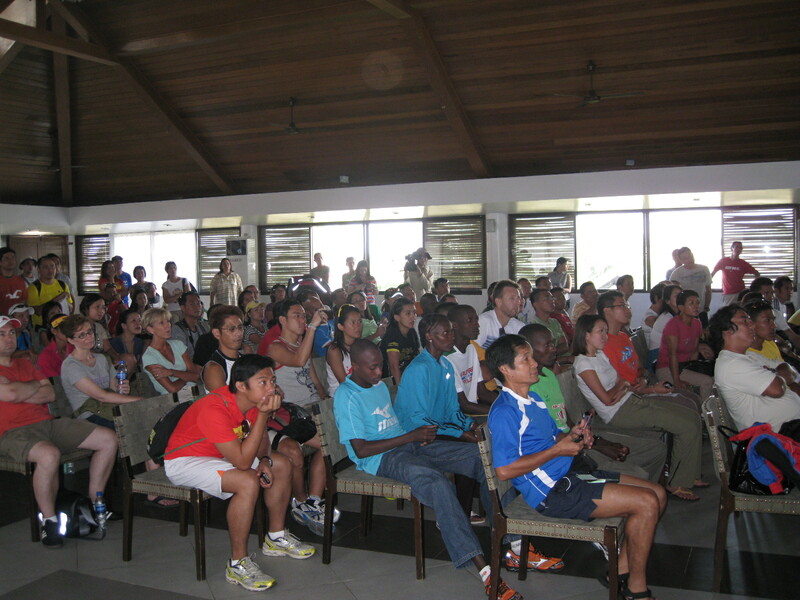 I observed that a lot of international runners attended the briefing and I saw new faces from the Kenyans. I even saw athletes whom I was informed to be from Russia. I was able to meet other runners who are regular participants of my PAU races as well as runners who came all the way from the Visayas and Mindanao. Definitely, this running event was a meeting place of the avid and passionate runners from all over the country. 9. A day before the Marathon Race, I requested the Battalion Commander of the 565th Engineer Battalion to assemble his officers and men for an “impromtu” Running Lecture which will guide them to a more scientific way of training in preparation for a running event. The running lecture was done after one hour with the hope that the soldiers of this unit would be able to train properly. I gave them the challenge for them to join the next year’s half-marathon race after imparting to them the basic principles in training as well as tips in running. I told them that they are lucky and fortunate to have the Provincial Oval Track located just in front of their camp. In conclusion, the most important thing that I emphasized to them are the good values each one of them to develop while they are preparing for a running event. 10. The race was conducted perfectly as the race started promptly at 4:00 AM; there was a “festive” mood at the starting line which was highlighted with fireworks; lots of photo-ops with runners; greetings from the “usual suspects” in marathon races; lots of hydration points; proper markings along the road; presence of volunteers and marshals along the route; fresh bananas, sports bars & sports gels (although some were “expired”) were available to the runners at the 2nd half of the marathon route; and most of all, the presence of spectators who were cheering and greeting the runners! My Favorite Racing Shorts & Singlet For Marathon Races! 11. Kenyan runner Richard Kemeli Kemboi won the Marathon Race with a time of 2:19:40 hours. In the women’s category, Ethiopian Ayelu Lemma Geda won the race in 2:40:05 hours. The Champion received a Cash Prize of $ 7,000. This could be the highest paying marathon race for this year in the country. My Elite Team managed to win First Place & Third Place (Local Category) for the Half-Marathon Race with a Cash Prize of P 20,000 and P 10,000, respectively and 3rd Place (Local Category) for the 10K Race. My team did not make good in this running event due to sickness and flu weeks before this race. See you on the roads and trails!!! Days before the conduct of the PAU’s P2P 70K Run in Ilocos Norte, Frederick Gabriel and Vic Viola of takbo.ph approached me with the request for their company to conduct a running lecture and clinic to their staff and employees numbering to about 200. It was only during these conversations that I have found out that these two ultra runners and consistent PAU runners are connected with the company called AIR 21. Their request was very noble that it was worth making it as a priority because of the number of participants plus the interest they put into the importance of running as part of the company’s sports program and the company’s program to look for the welfare of their subordinates through running as part of their active lifestyle. 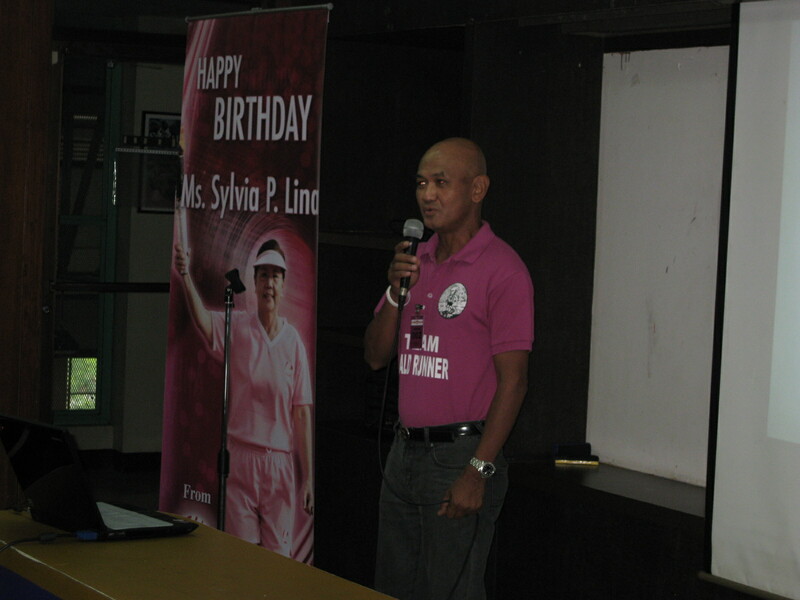 The lecture and clinic was decided to be conducted on the Company’s Health & Medical Expo Day which was held on the Birthday of Mrs Sylvia Lina, co-owner of the company and wife of Mr Alberto Lina, President & Owner of the Company. 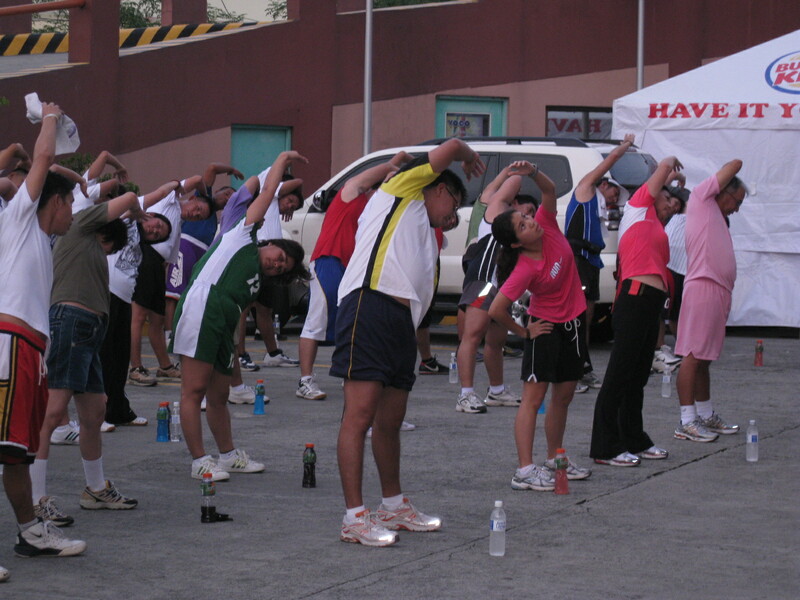 The lecture and the first session of actual running was conducted at 3:00 PM of September 6, 2010 at the Company’s Cargohaus near the NAIA Airport Complex. I was impressed that the owners of the company, Mr & Mrs Lina and their two daughters attended the lecture and the practical part and actual demonstration of the stretching exercises, running drills, and a 30-minute run. 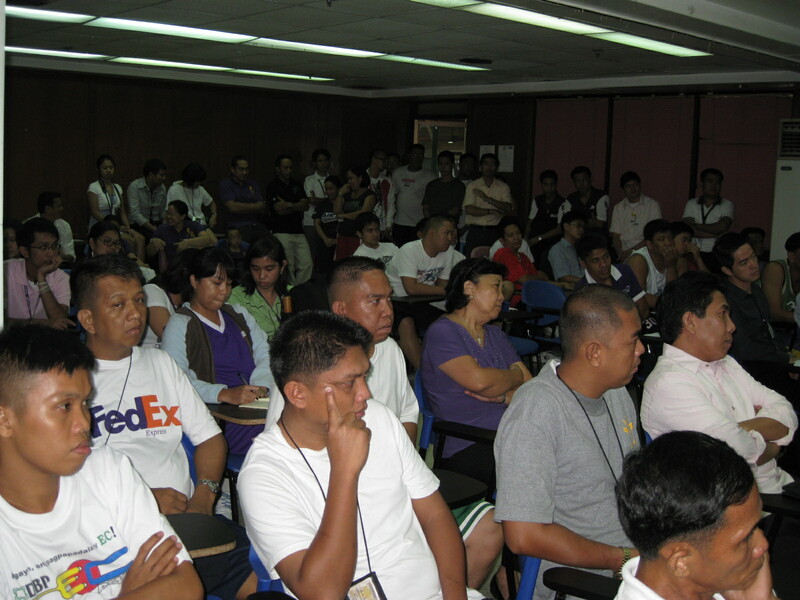 The lecture room was “jampacked” with the staff and employees of the company that most of them remained standing during the 1 1/2 hours of lecture and open forum. Basically, the lecture covered the “Why’s” of Running, Steps To Follow, Laws of Training in Running, Practical Tips In Running, Phases of Training, and lastly, Etiquette In Running. 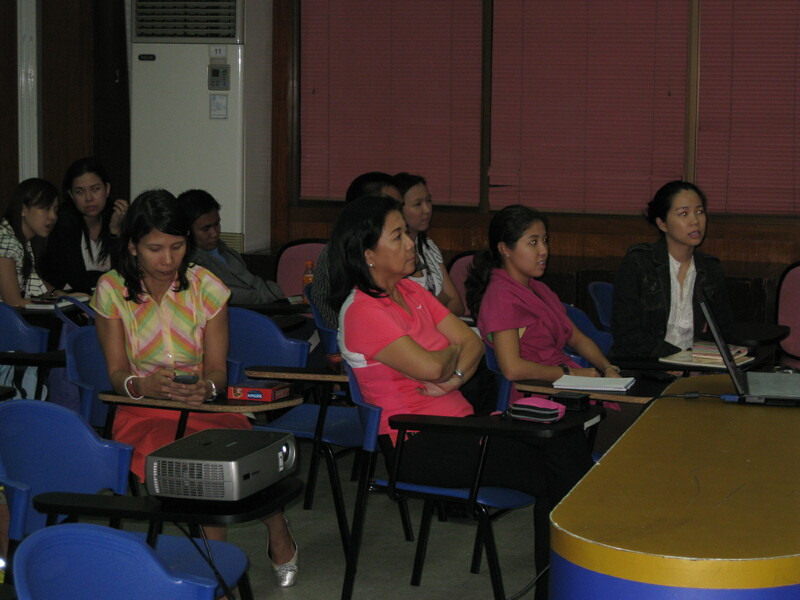 Some concerns and apprehensions from the participants were answered during the Open Forum. The lectured was followed with actual involvement of the participants in the conduct of stretching exercises, running drills, and a 30-minute steady run. The clinic is scheduled to be conducted every Monday afternoon up to October 10 with the hope that every participant will be able to finish the scheduled 3K and 5K runs on race day. 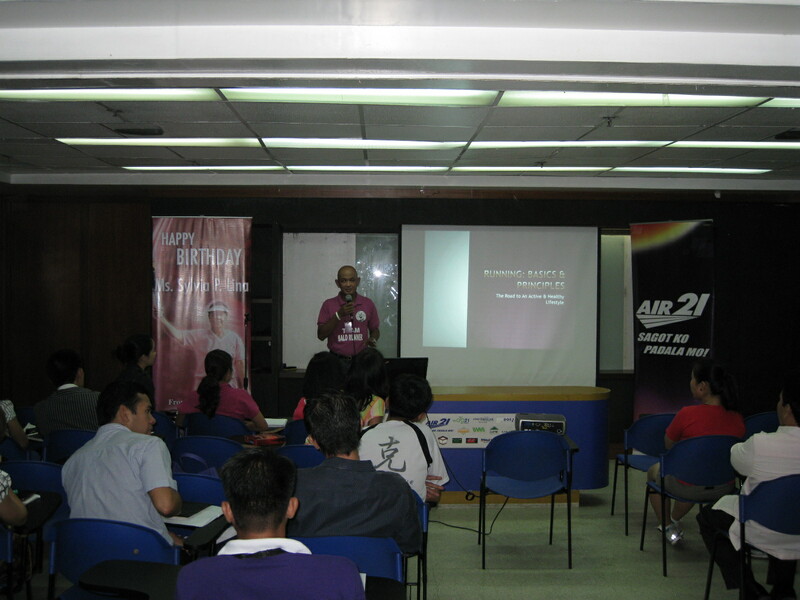 The following pictures will best describe the activity on September 6 with Mr Alberto Lina; Mrs Sylvia Lina; their daughters and the rest of the staff and employees of AIR 21. For a related story about the AIR 21 Running Lecture and Clinic and more pictures of the event, please visit www.lina-group.com. Why PAY if you can run at “race pace” for FREE? The Bald Runner’s Events Management, in cooperation of the Armed Forces of the Philippines, will be offering FREE Fun Runs to everybody! Yes, these fun runs will be free—no race bibs, no singlets, no printed race results, no Finisher’s Shirts and no registration fees. But there will be a digital clock or chronograph watch at the Start/Finish Line and it will be the responsibility of each runner to see, hear, and remember his/her finish time. All you need to bring are your running shoes and your running attire. Runners could bring also their respective hydration system/bottles during the race, however, there will be minimal number of water stations along the race route. Interested runner-participants just simply assemble at the Starting Line before 6:00 AM of the scheduled date of event and the start of the fun run is set at exactly 6:00 AM. Runners will be guided by the members of the Elite Team Bald Runner during the runs. There will be no marshals as the route will be easy to follow through directional signs and kilometer markings. For documentation purposes, each finisher will receive a Finisher’s Certificate for FREE! These fun runs will be a good training runs for “newbies” and the youth (18 years old & below) who would simulate a road race and for them to develop confidence in paid road races. As for the competitive runners who would not like to spend their hard-earned money in road races, they can do their “race pace” or “tempo run” workouts in these fun runs. These fun runs are conceived to be conducted at least twice a month on Sunday mornings. The first Fun Run will be a 5-mile or 8-kilometer run inside the roads of Camp Aguinaldo and the 2nd Fun Run will be a 2-mile run or 3.2K run at the Philippine Army Grandstand & Parade Ground. The fun runs will start promptly at 6:00 AM during Sundays. In Camp Aguinaldo, the start/finish area is infront of the Grandstand at the GHQ Parade Ground. These places have ample free parking spaces for the vehicles of the runners. After each fun run, there will be a brief lecture and open forum for 30 minutes to interested runners. These fun runs should be terminated within the period of two hours. 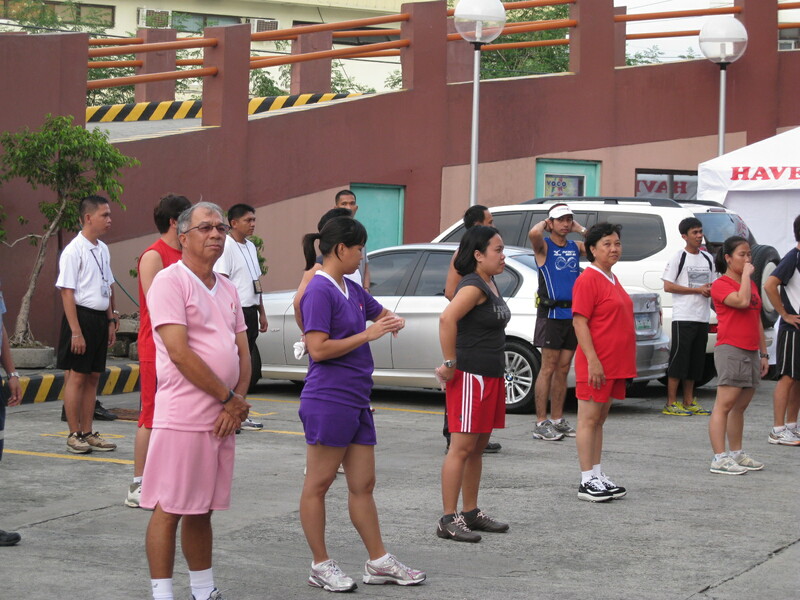 The first Fun Run will be held at Camp Aguinaldo o/a 6:00 AM of October 17, 2010. There will be no limit in the number of runners in this fun run. However, all runners should be at the starting area at least 30 minutes before the start time. 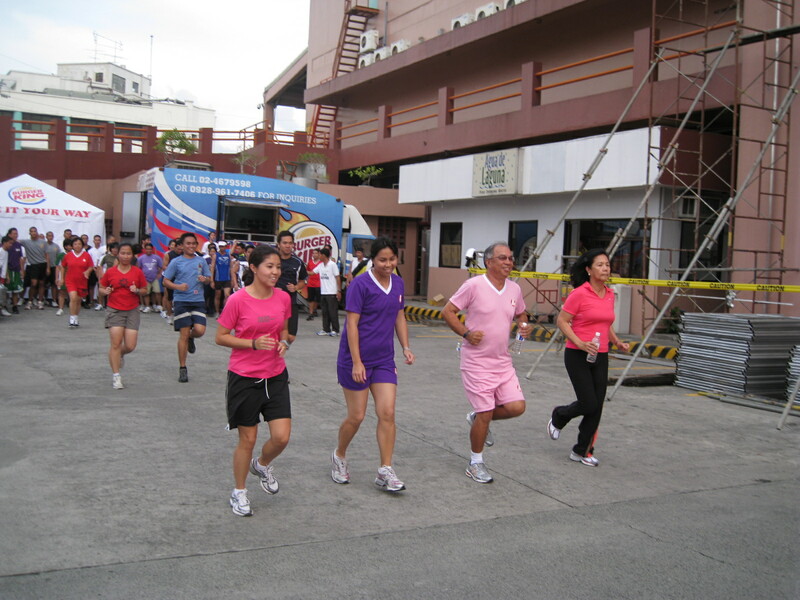 The 2nd Fun Run will be a 3K/5K run at the Philippine Army Grandstand o/a 6:00 AM of October 24, 2010. Schedule of future Fun Runs will be announced in this blog. If plans will materialize, future Fun Runs will be conducted at The Fort/Global City, MOA Grounds, and Roxas/Macapagal Boulevard. These Fun Runs will reach a maximum distance of 10 miles or 16 kilometers and with a minimum distance of 3 kilometers. Running should be made simple and free! Running should be FUN! 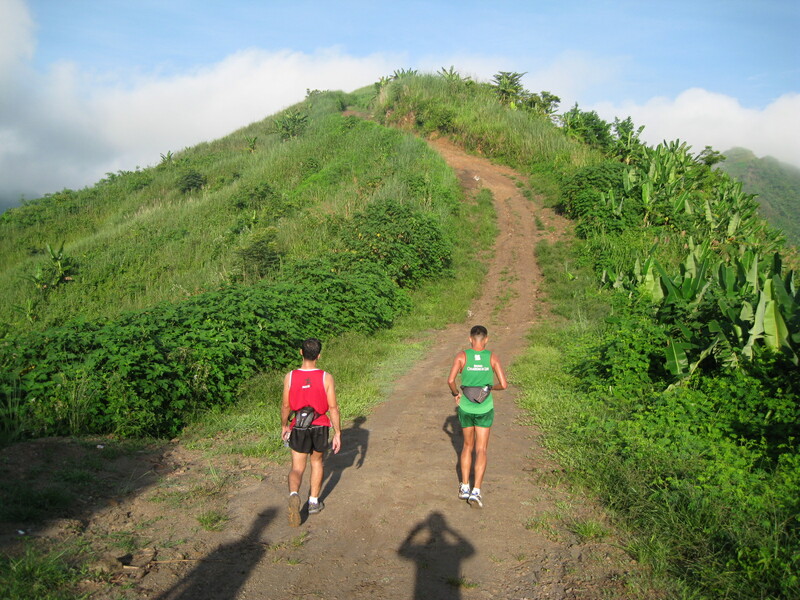 Early this week I received an e-mail message from Atty Jon Lacanlale of Team Clark inviting me to join their group for a mountain trail run in Porac, Pampanga. I was specifically mentioned in the invitation by the host of the event, Jerry Guiao, a BDM 102K veteran, to join the said run. I immediately confirmed my attendance to this trail run as my training ground is near the place. I was actually invited also for another run to the peak of Mt Arayat in Magalang, Pampanga on the day after the run in Porac. But, I begged off not to join the run to Mt Arayat as I have another commitment for another long run at the Subic Freeport on the following day with Team Bald Runner-Professionals. The Team Clark was already waiting for me at the Porac Exit of SCTEX as arrived thereat at 5:00 AM. I was a part of a 4-vehicle convoy to a 2-3-kilometer distance from the SCTEX as we proceeded to the center of Barangay Sapang Uwak of Porac where the start of the run is located. After a short trip, we parked our vehicles and started to check and wear our respective hydration system. Our run started at 5:40 AM and the visibility was already clear. 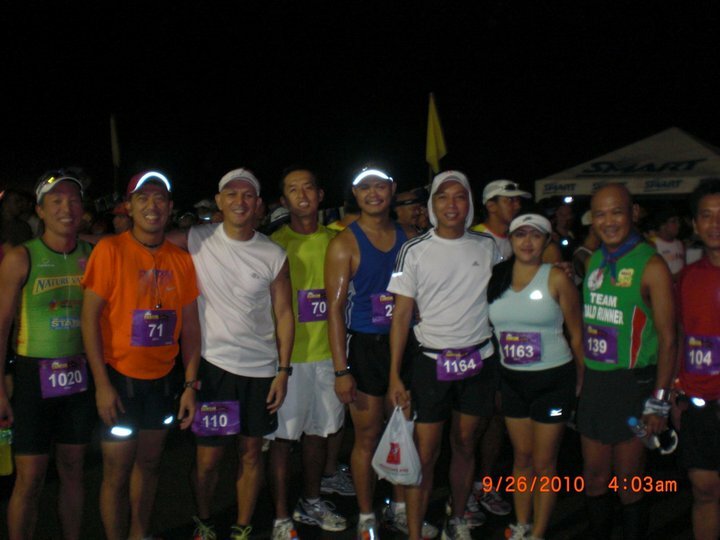 The running group consisted of Atty Jon, Jerry, BR, and two elite runners of Team Bald Runner. The rest of the Team Clark served as our support crew. We started with slow jog, then to slow run until we reached the first uphill climb. The first uphill climb was so steep but we tried our best to slowly jog up to the crest but after a few meters, we were met again with another climb. I could no longer count the number of uphill climbs we encountered during the run. I could say that this route is more challenging than the route that I considered as my training ground in the “Brown Mountain”. Admittedly, this place is more scenic and the air is cooler and more refreshing. Jerry prepared for this run as he prepositioned our water station with a 5-gallon water container at the 5-Km mark a day before our run. With a cooler temperature early in the run, I only consumed one-half of the water in my Nathan Bottle and had it refilled in anticipation for more uphill climbs and hot temperature later in the day. 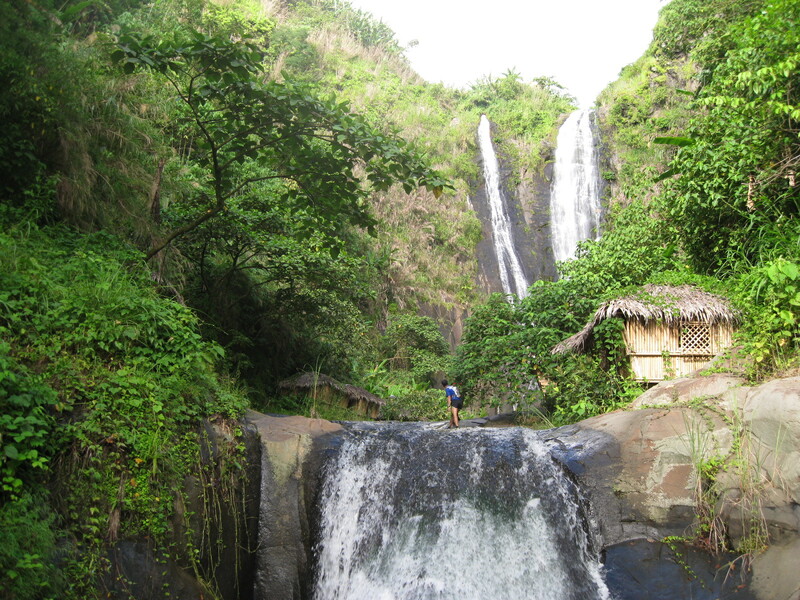 As informed by Atty Jon in his invitation, our one-way trip of 10K with take us 2 hours and there is a side trip also to a waterfalls near the turn-around point. He was right as we reached the 5K point in one hour of run and brisk walking. As if we were running a trail race, we have to brisk walk on steep uphill climbs and then run on the level parts and run faster on the downhill parts of the route. 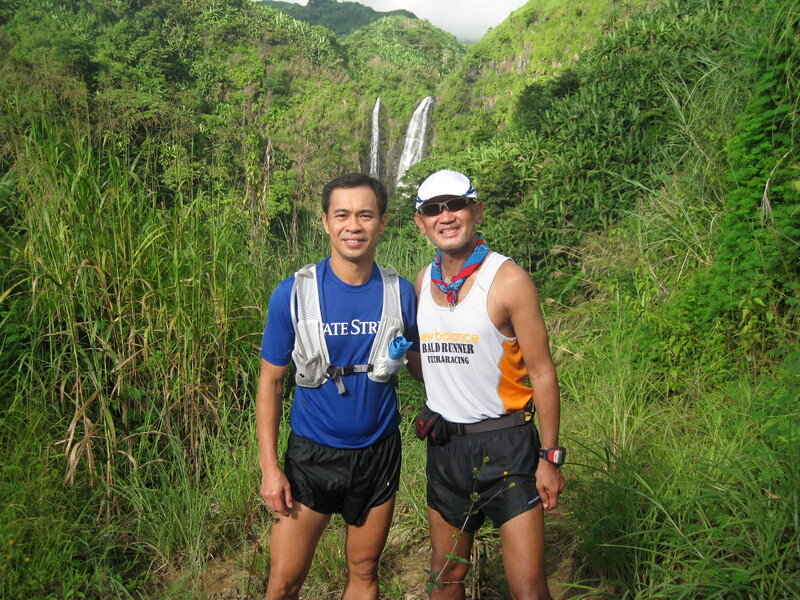 Atty Jon and I had a lot conversation while running as we exchanged tips in ultra trail running training and races. It seems we have the same insights and race strategy in ultra trail running and I am confident that he will make good in his next ultra races here and abroad. After walking and running for almost 2 hours and after my GF 305 registered a distance of 10.5K, we turned left to a single-track trail which is covered with grass and wild plants. From this point, it was time to “bushswack” for a distance of 1.5 kilometers down to the waterfalls. Practically, we were walking along a cliff but the sound of the waterfalls made us more excited to reach the place. I was amazed with the beauty of the waterfalls. After my picture was taken, I immediately removed my singlet, shoes, socks and my watch and submerged my core and legs into the cold water of the lagoon. The feeling was relaxing and soothing to my tired legs. We stayed in the area for about 30 minutes and prepared for our run back to where we started. Our run back to the center of the barangay was a challenging one as the heat of the sun was on us. I had only half-filled water bottle for the next 5 kilometers and I made sure that my water was enough before reaching our water station. As I reached our water station, I was able to drink one-half liter to recover the loss of water due to perspiration. After the 22-kilometer run in 4 hours and 20 minutes, we had our late breakfast with stewed native chicken and steamed rice wrapped/cooked with banana leaves, fresh ripe banana and ice-cooled Gatorade. The food was perfect for runners! I was informed later by Jerry that the trail will be finally connected to Mt Pinatubo by next year. The construction of another 4-kilometer distance of dirt road from our turn-around point to the base of Mt Pinatubo will start before the end of the year. Atty Jon and I were already discussing for a possibility of a trail run from Brgy Sta Juliana, Capas, Tarlac to Brgy Sapang Uwak, Porac, Pampanga and back or vice-versa. This trail run experience will be exciting for ultra trail runners. 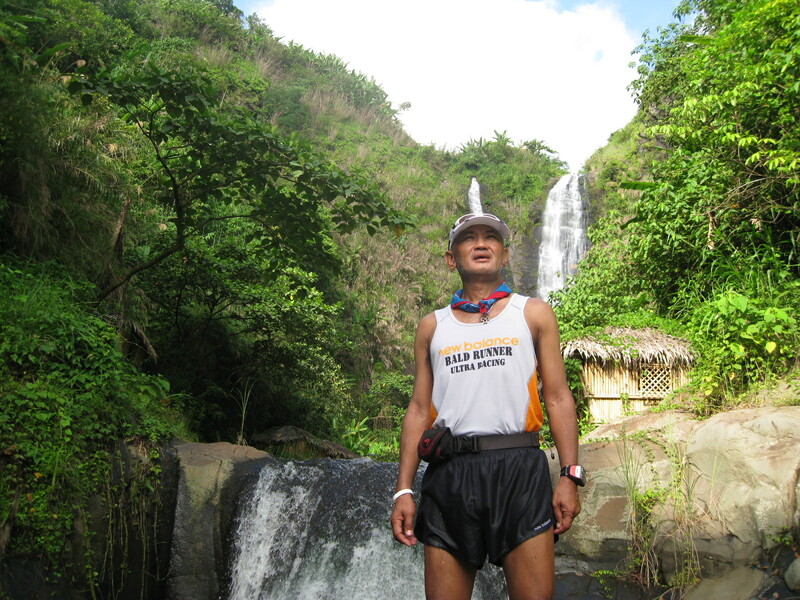 My sincerest thanks to Jerry as our host, Atty Jon and Team Clark for a wonderful and exciting trail run and visit to the beautiful waterfalls in the area. I promised to myself that I will be back to the place for more trail runs and relaxing moments at the lagoon of the waterfalls. (Note: I am sorry I could not download the pictures sent by the members of Team Clark and have them posted in my blog. My laptop must have some problems. However, I hope Atty Jon would be able to post the remaining pictures in his blog).